Mobile technology has advanced a great deal in the last few years with smartphones and tablets not only looking more stylish than ever, they also offer so many more features than products previously. Trouble is this new tech can sometimes become troublesome with regards of the built in batteries running out of juice at the most inconvenient times. Solar power for such products are nothing new, but today we have news of the strangely named WakaWaka Power that is a solar mobile charge and a light. We often bring you clever new ideas that are looking for backers on the Kickstarter Project and today is no different with this latest product. 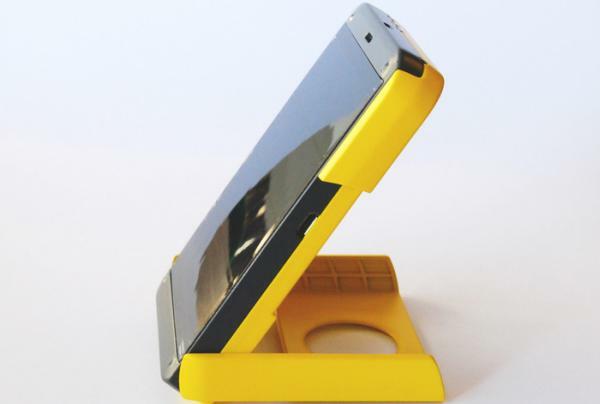 The WakaWaka Power is capable of charging almost any mobile device including smartphones and tablet PCs, and is promised to offer the perfect solution when out and about using such a device. Many solar chargers that are already available can be rather bulky and difficult to carry around with you, but this product is promised to be a pocket sized power station that uses supper efficient solar cells along with a power management system. This is promised to provide efficiencies of up to 200 percent better than any other similar product currently available, and besides just charging your mobile device there is also a light source that can last of over forty hours on a single day’s charge. If the device is placed in direct sunlight for the whole day users will notice the battery would be completely charged, and even in places that the sunlight is not so intense. The battery has enough capacity when fully charged to replenish the battery on a smartphone even when it was completely run down. The product also features a number of built in LED’s that notify the user when the WakaWaka is charging, how full the battery is, when your mobile is charging, and more. Below you can see a video of the device that we have embedded for you, and at the time of writing the WakaWaka Power has 5,289 backers raising a grand sum so far of $388,214 out of a total of $50,000, and the project has another 34 hours to run. For more information or to back the project yourself hit the link above and check out the video below. Have you ever used a solar charging product on your mobile device? Their Kickstarter goal is $50,000 and not $500,000.